The woman who lost her job after displaying her middle finger to U.S. President Donald Trump's motorcade is suing her employer. The woman who was fired for giving the middle finger to U.S. President Donald Trump's motorcade says she lost her job because she "did not have the right politics." In the lawsuit filed Wednesday in Virginia, former marketing executive Juli Briskman claims Akima LLC violated state employment law and her right to free speech because the government contractor feared retaliation. The allegations against Akima, an umbrella company of various government contractors, have not been proven in court, and the company did not return an email from The Associated Press seeking comment. 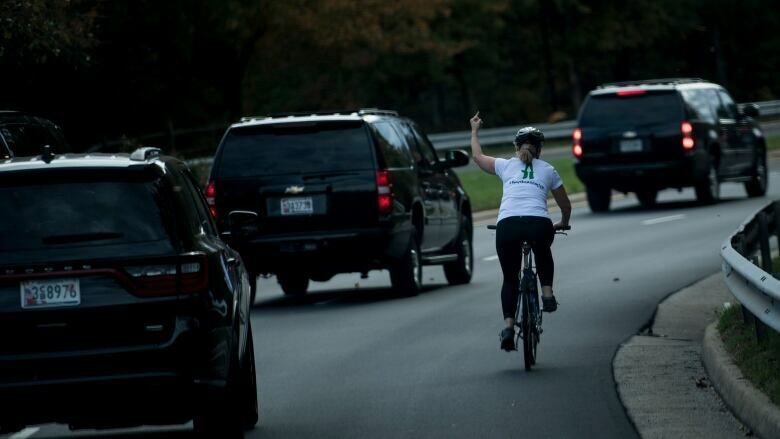 Briskman was on a weekend bike ride in Sterling, Va., in October 2017 when she was photographed by Getty's Brendan Smialowski making the gesture. "All of my frustration with this administration and Mr. Trump welled up inside of me and I flipped off the motorcade," she told As It Happens host Carol Off. She also posted the picture on her personal social media accounts. "They said that the social media content on my Facebook and Twitter accounts was obscene and that violated their company policy on social media," she said. "But they also said that it was a risk for them basically to have me on staff because I didn't support the regime… I didn't support the person that's heading our government right now. Because they are government contractors." At first, the single mother of two said she was devastated. "I drove home that day terrified about how I was going to pay my bills, how I going to cover my health care," she said. "I mean, I am the person that my kids depend on the most. I cannot go down." Then she remembered her colleague who called someone a "f---ing libtard a--hole" on a Facebook post about Black Lives Matter. That man, who she did not name, was allowed to keep his job so long as he deleted the comment, she said. "When I looked to see that he had kept his job, at that point I became righteous, I became angry, I became energized — and since then I have absolutely no regrets," she said. "And I will continue to fight for this." Written by Sheena Goodyear with files from The Associated Press. Interview produced by Imogen Birchard.